This Thanksgiving, we know the “Hostess with the Mostest” and she happens to live in Geneseo, IL. 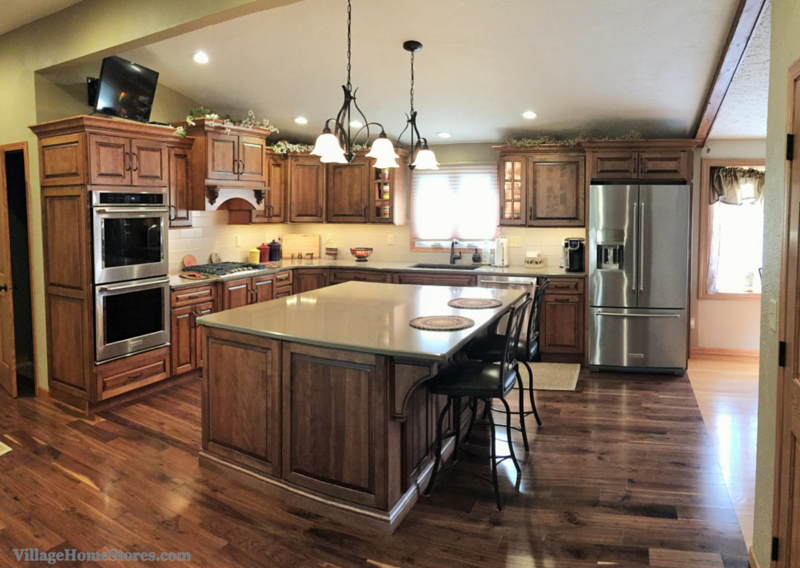 We can’t think of a better week to share this recent kitchen remodel with you than the Thanksgiving holiday because it is the ultimate space for entertaining and preparation. 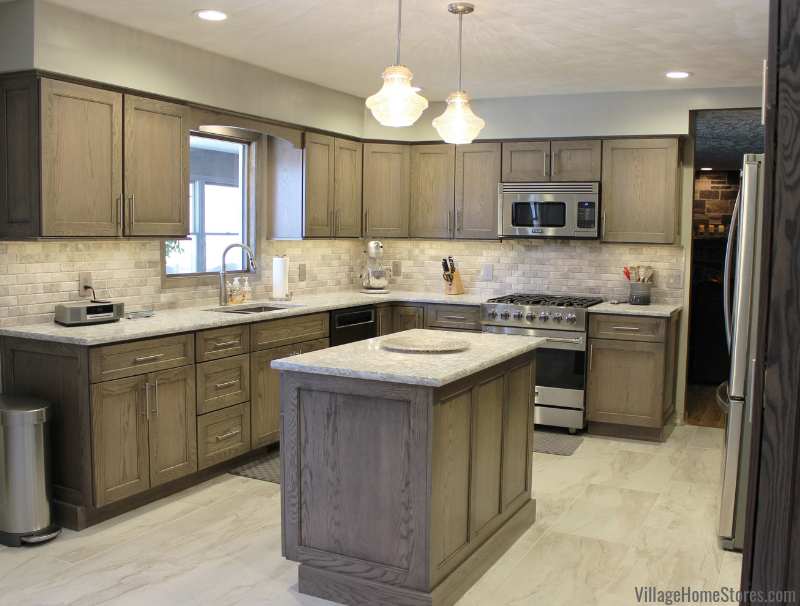 These customers have waited many Thanksgivings to get to experience the one they are about to host in their new kitchen from Village Home Stores. 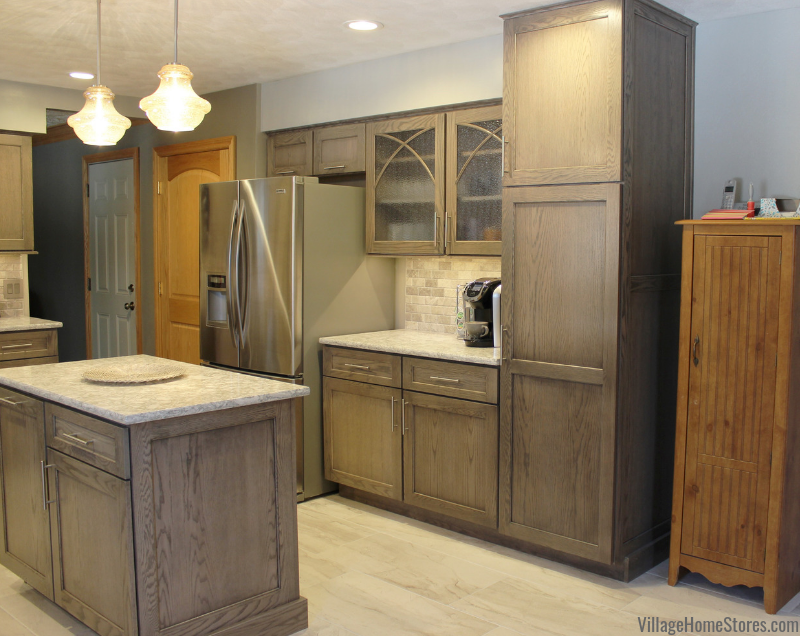 Just look at this open, warm and inviting kitchen! It is hard not to feel comfortable in the new space and we can only imagine how good it must smell right now from all of the holiday foods getting prepared and served from it. At the very heart of the new kitchen is a large single-level island with and overhang fit to host two seated guests. 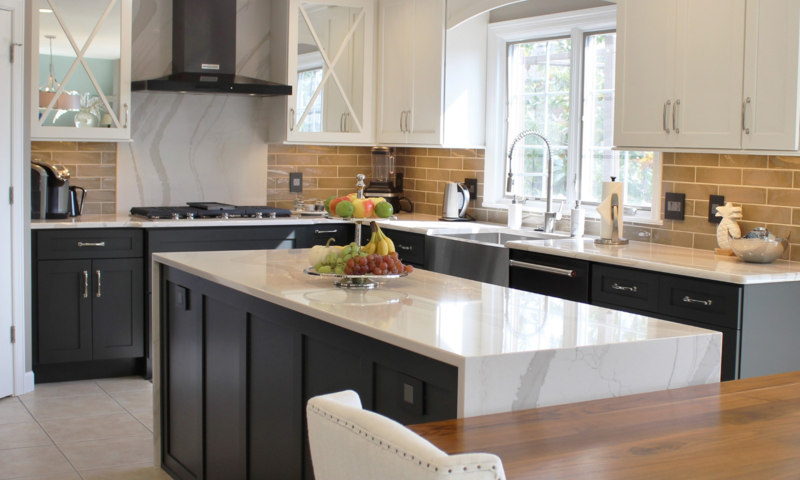 This single piece of Cambria Quartz in the “Walton” design is not only the ideal work surface, it is in the best location for all zones of the new kitchen. 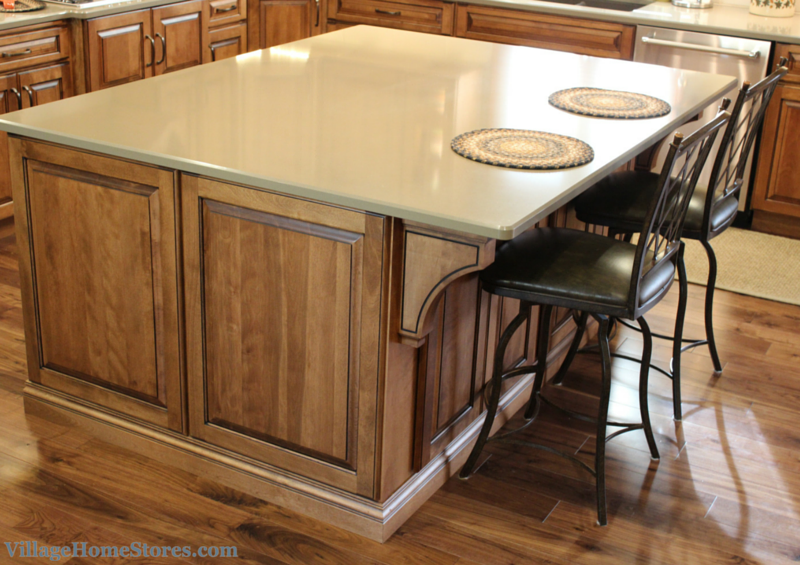 This 4′ x 6′ island top is within reach of the fresh food storage zone, kitchen clean up zone, and both the cooking and baking zones. Speaking of those cooking and baking zones, we think those might be the areas that most Thanksgiving hostesses would be jealous of in this kitchen… beginning with the three ovens available in this new design. 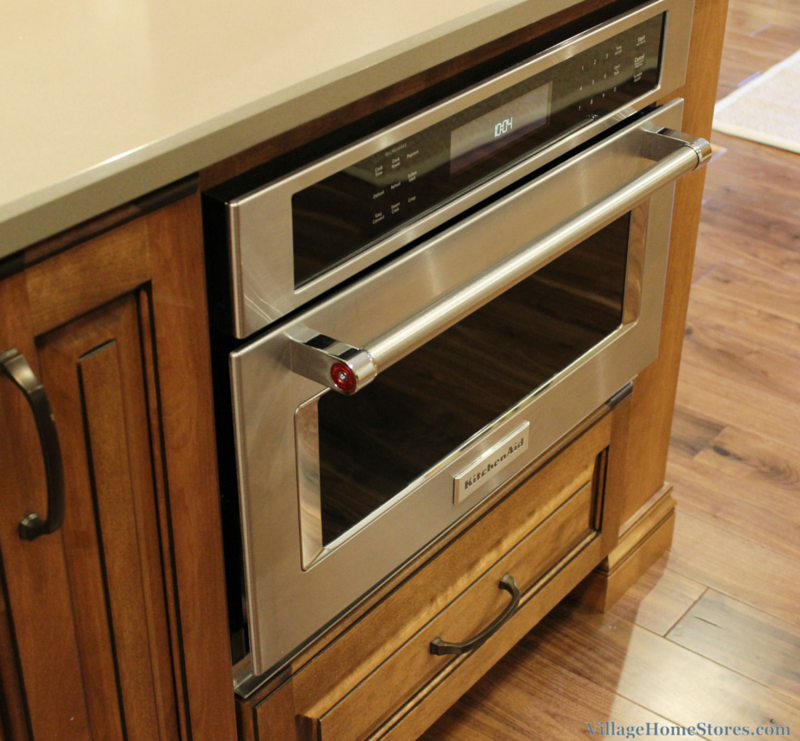 A 30″ wide built-in unit from KitchenAid offers two ovens for use. When you consider the True Convection features included in each of them, this built-in unit can bake six racks of items at the same time at a consistent temperature within the cavities (each 5.0 cu. ft. in size). Imagine getting your Christmas cookies baked all in one session! 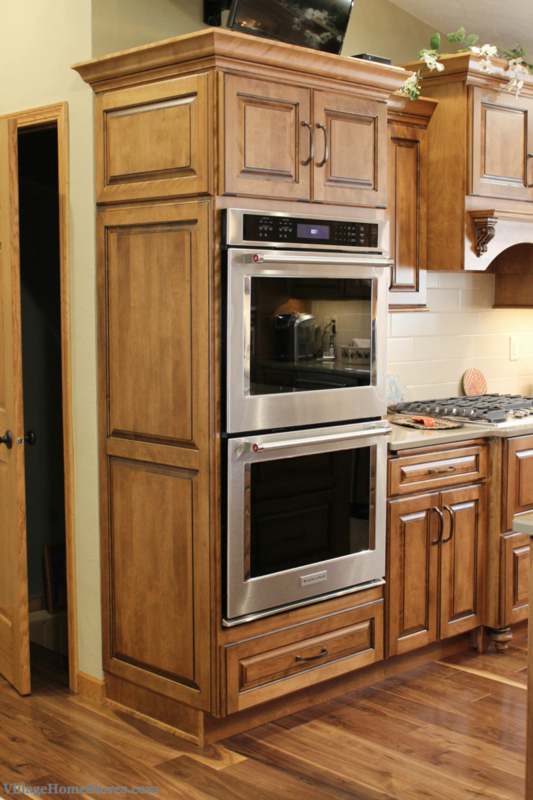 But wait….we said three ovens right? 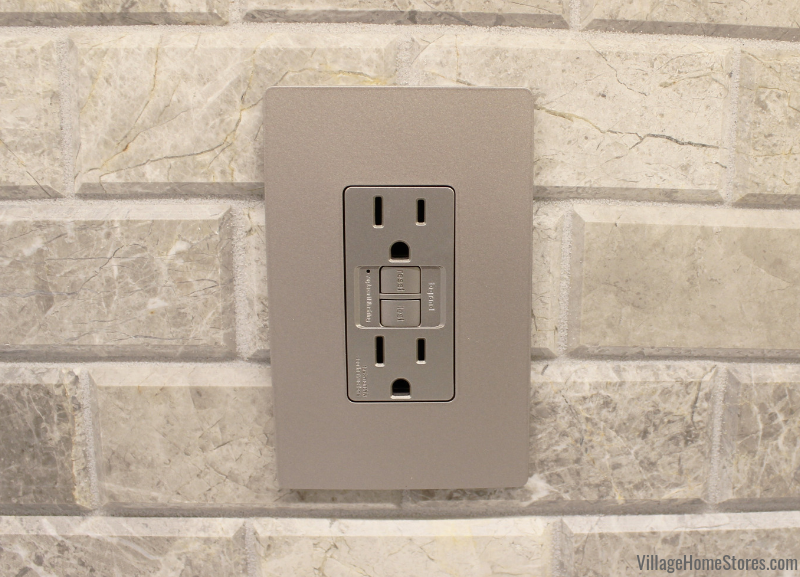 Well directly across from the double wall oven in the island is a built-in microwave also from KitchenAid. This model of built-in microwave also includes convection features. Making it a fully-functioning third oven when needed. It even broils. For those handful of times throughout the year when you wish you had another location for prep or even warming items, imagine having three! This kitchen is not just ideal for baking. The cooking area of the new kitchen is the visual focal point of the space. 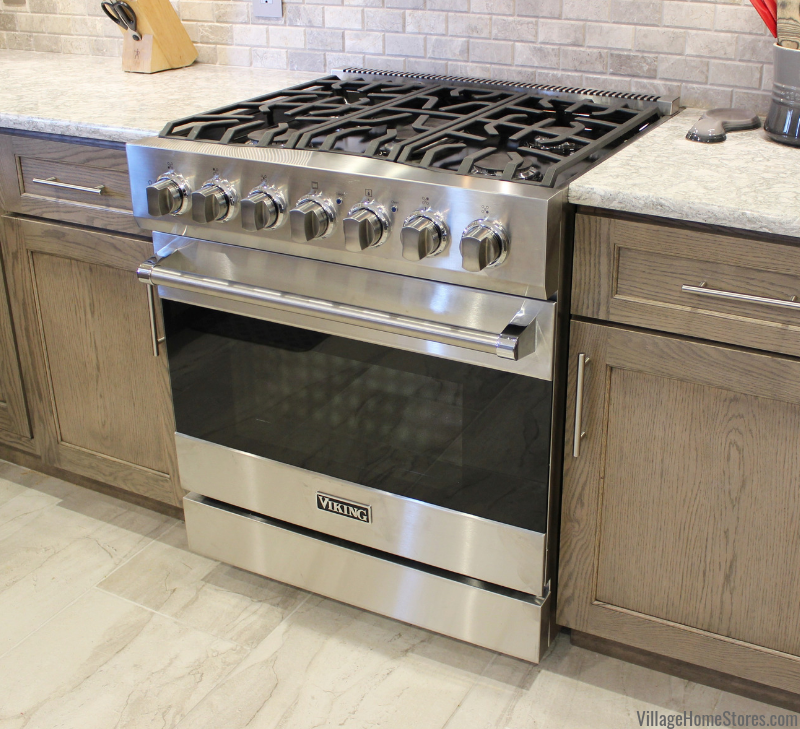 Surrounded by great features and prep space, the 5-burner gas cooktop by KitchenAid includes a lot of burner options and is only a 30″ wide unit. 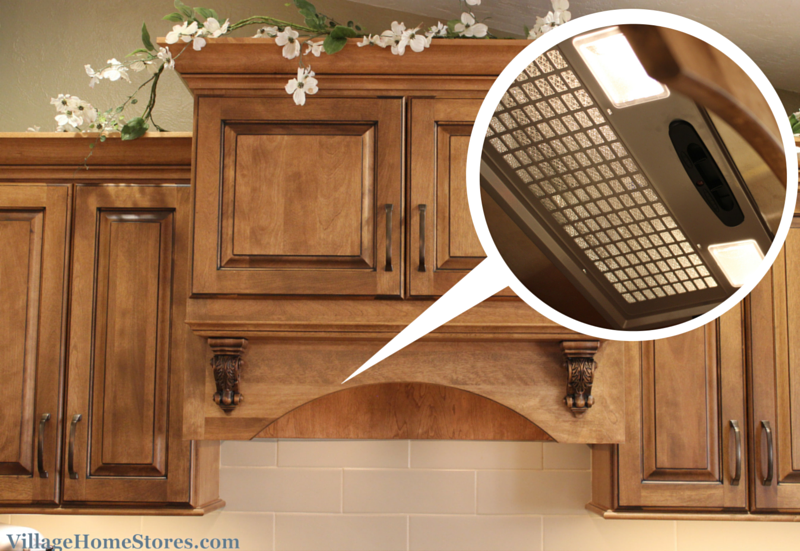 Full-width cast-iron grates make it easy to move from a high BTU burner over to a simmer or secondary location. 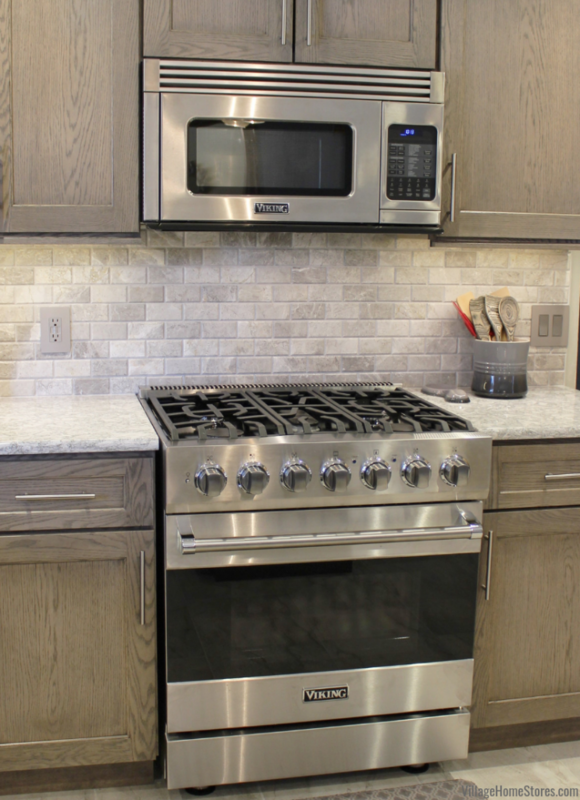 The cooktop is set into a a base cabinet that has a unique layout. This layout allows for a large pots and pans drawer below and a sliding shelf to access the space behind the doors above. The “reverse” drawer layout gives a unique look and helps create interest along with the decorative feet that have been added to the space. 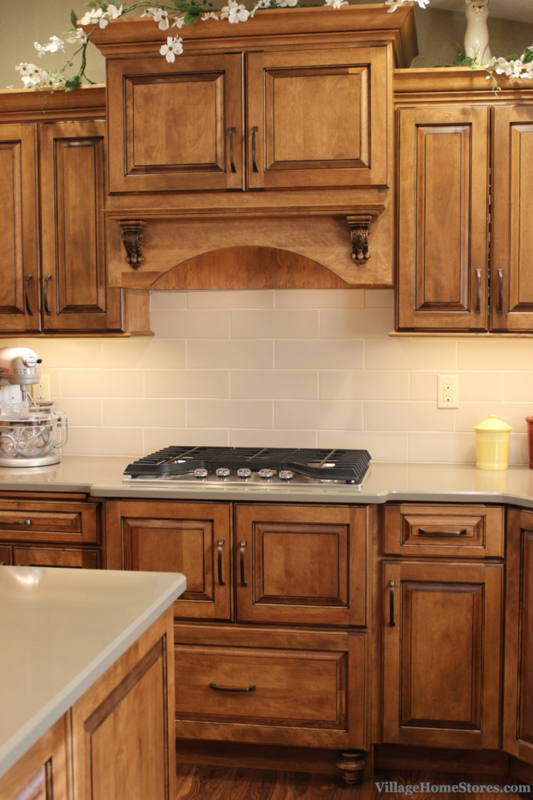 Above the cooktop is a decorative wood hood with a beautiful wood mantle and carved corbels. Hidden within the hood cabinet is a Broan hood insert that has been fitted with a re-circulation kit. 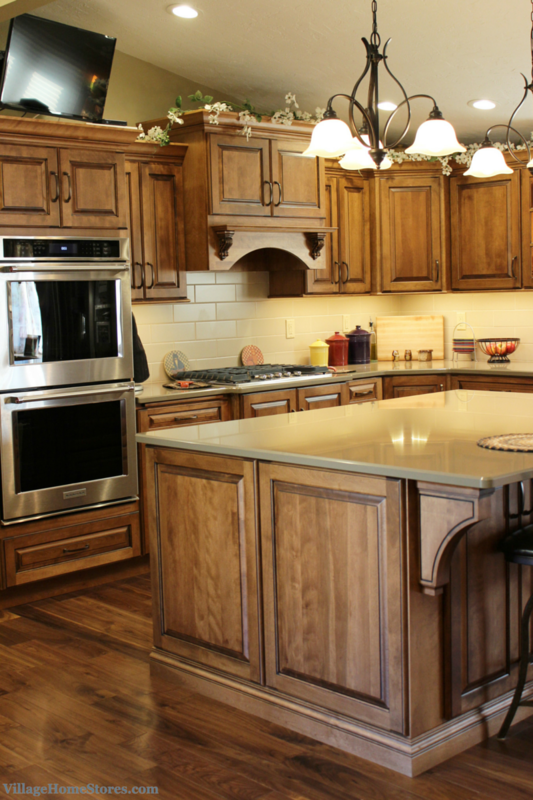 With plenty of “landing space” on each side of the cooktop, you have a lot of prep area if needed. 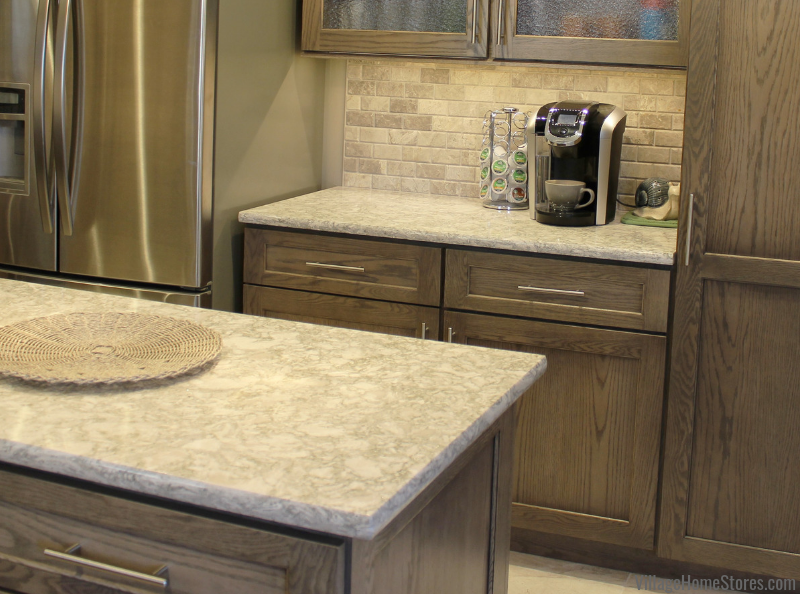 The large island countertop is directly behind the user in the cooking zone but the pathway between the two areas is large enough that multiple users still won’t feel crowded. 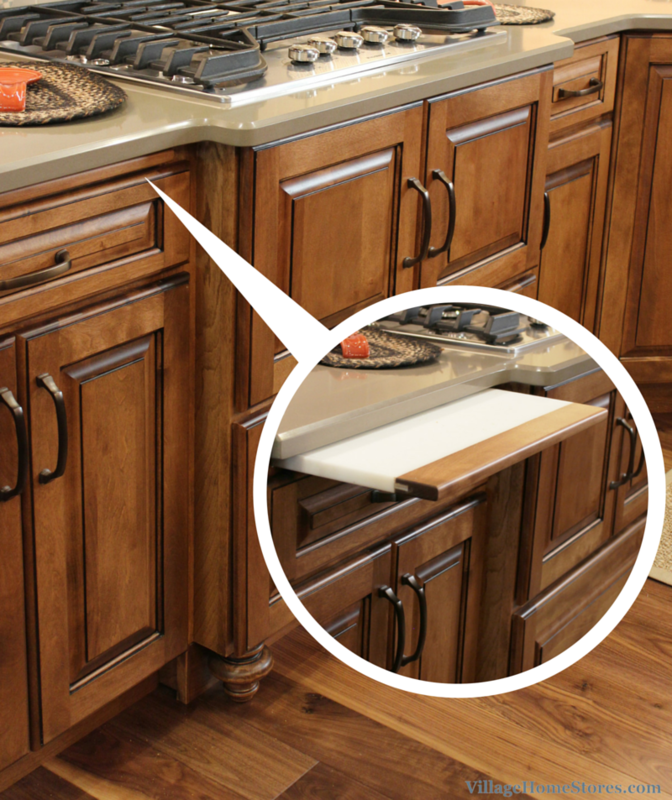 A pull-out cutting board is located right within reach of this zone. 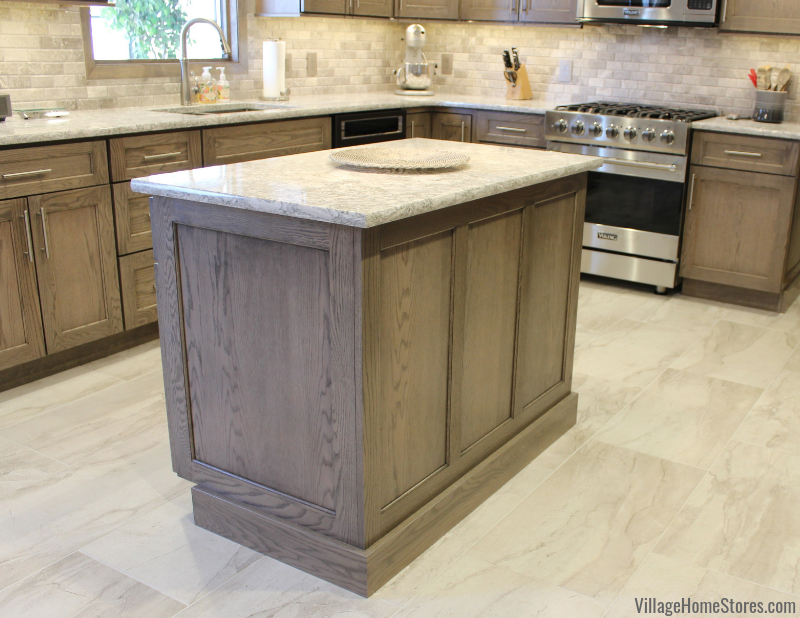 With such a large, multi-functional island, it had to also look as amazing as the rest of the kitchen. It is at the center of all activity AND attention after all. 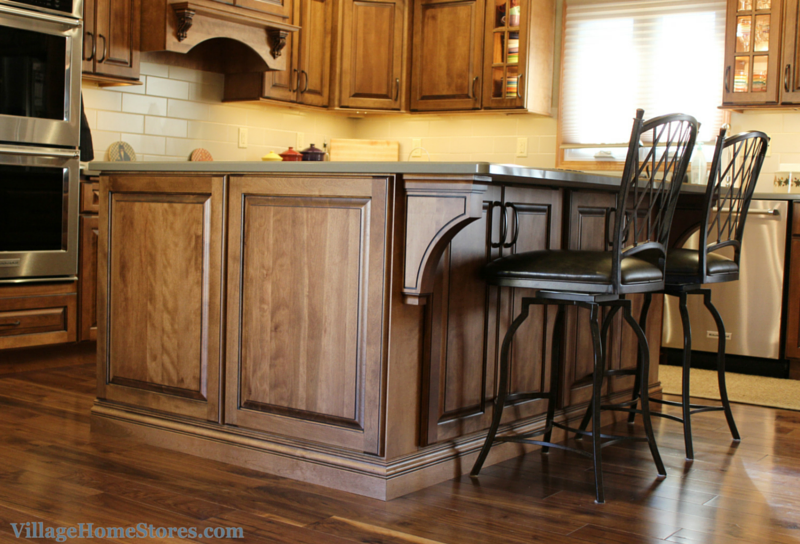 Decorative support brackets were installed underneath the countertop overhang. 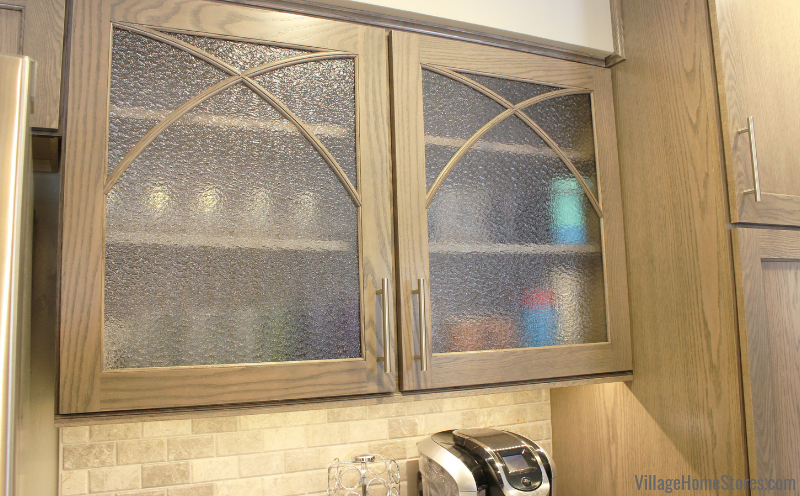 These helps give a custom look and also allows added opportunity for the black accent glaze to show some detail. 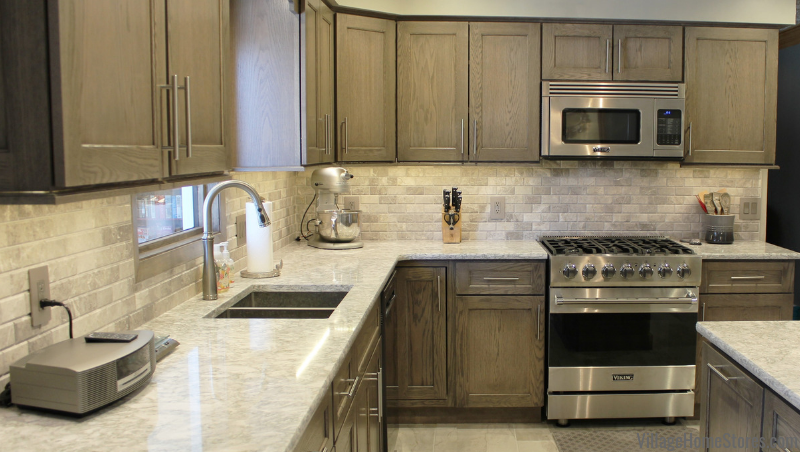 The cabinetry in this kitchen is from our Koch Classic line and is a Birch wood stained with the “Briarwood” finish and a black glaze has been applied. Above the island two large 3-light chandeliers hang. 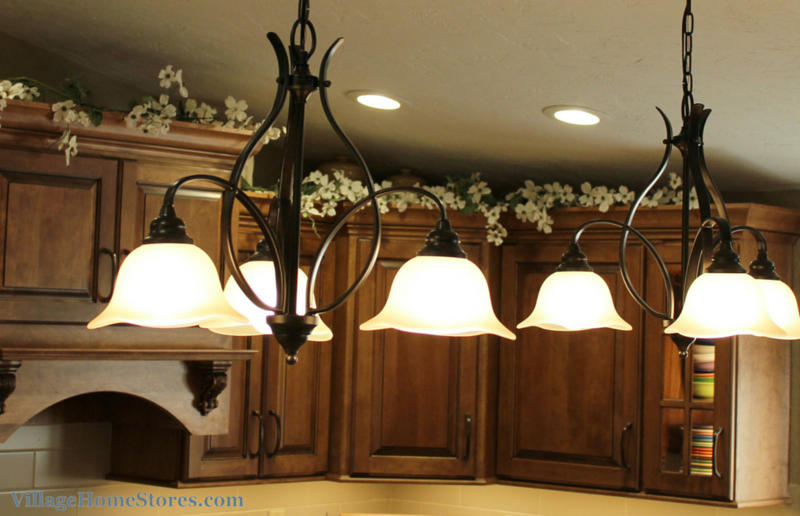 These lights by Feiss add a lot of style and allow your eye to look through and beyond them into the kitchen. Selecting the right quantity and scale of lighting above an island can be difficult on your own. 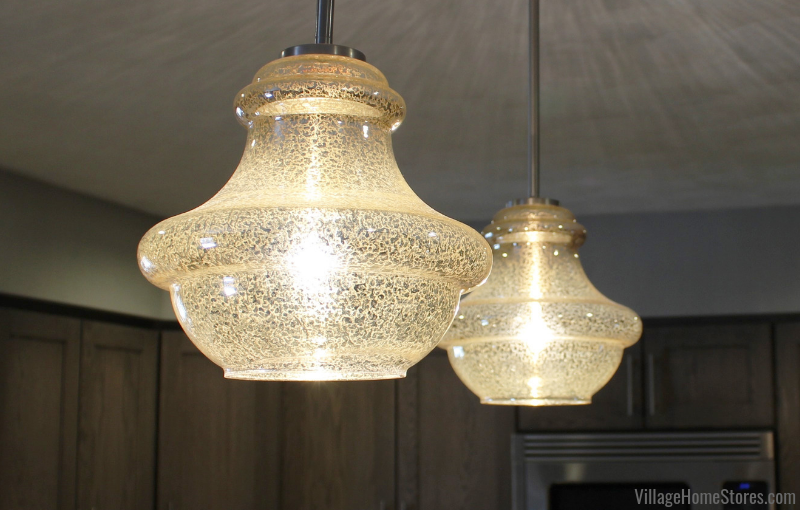 One of the advantages of having our own lighting department in-house is your kitchen designer and lighting expert can work closely with you to find the perfect choice for your project. With so much to tour in this great new space we can’t forget the work that went into creating it. 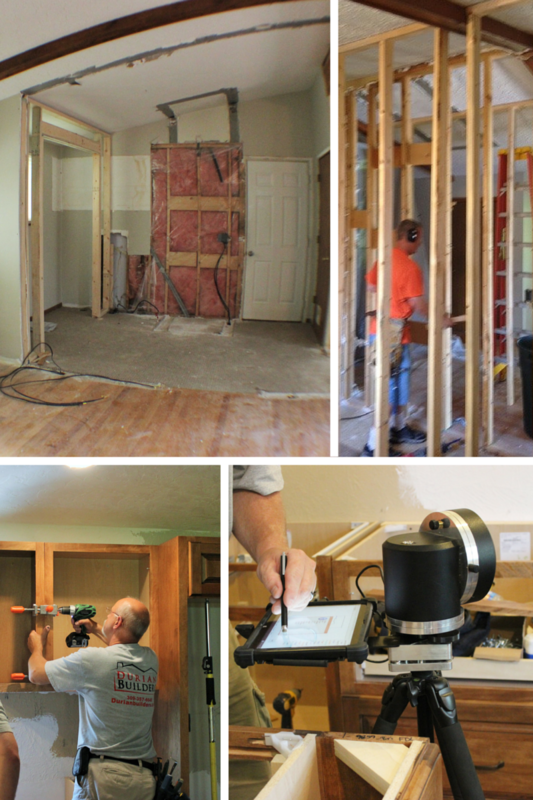 There were multiple walls removed and a lot of sub-contractors to coordinate. Our Full Project Management program was the perfect way to keep this project organized and stay on track for completion. High-ceilings were already a great feature in the original kitchen, but the kitchen itself was tucked behind walls and closets that kept the space from the great open concept you toured above. If you look at the wood flooring and carpeting in the photo above, you can see the ghost of the original walls that crowded the kitchen and front entry to the home. Village Home Stores arranged for a new front closet to be added and all new trim and doors for this completed space. The header you see at the center of the ceiling pitches was installed due to the walls removed. 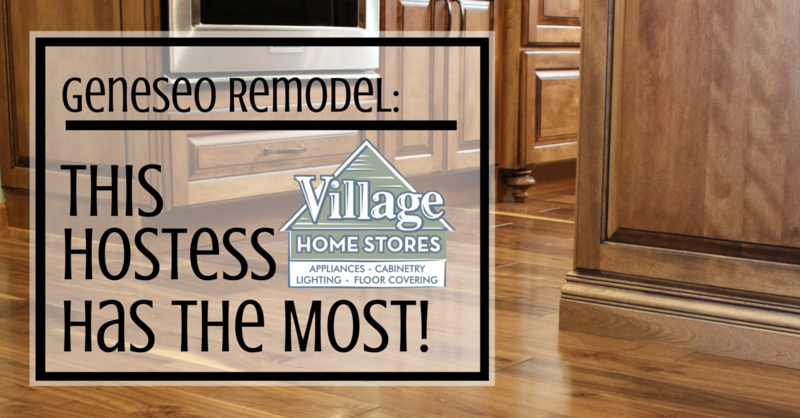 From demolition to the last cabinet handle being installed, everything was coordinated by Village Home Stores. 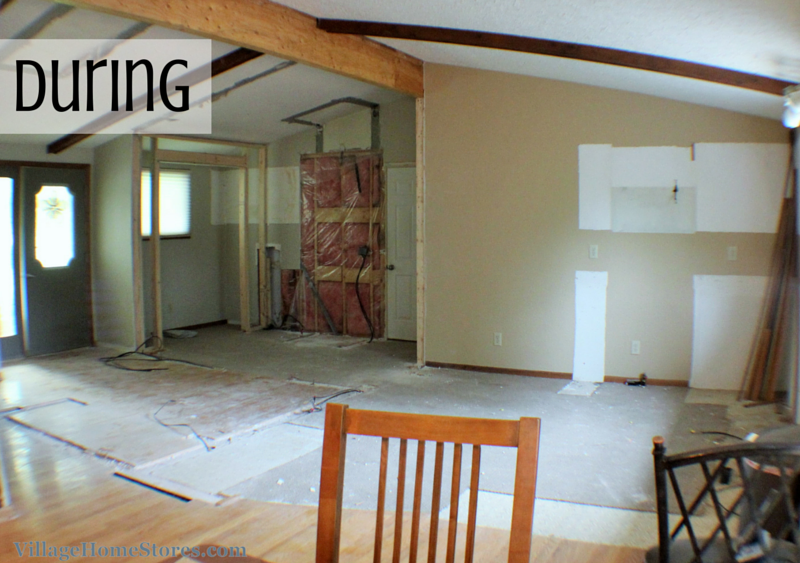 Taking on a project like this on your own can be quite a task. 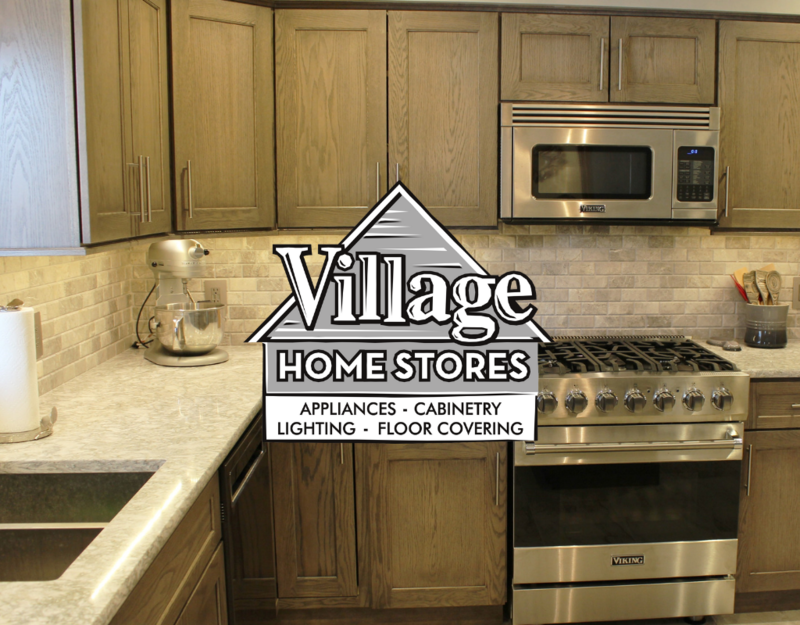 Village Home Stores can just provide an expert design and quality materials for your project, or take you every step of the way with our Project Management program. Whatever the experience you are looking for, we are here. 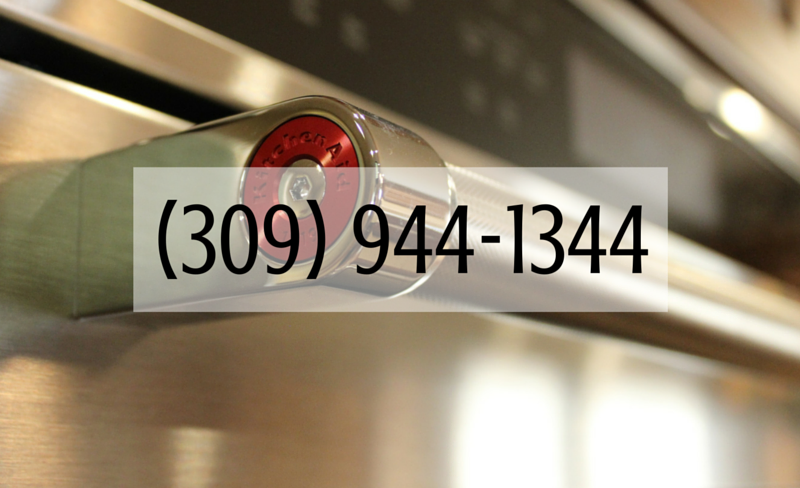 Call us today to make an appointment. 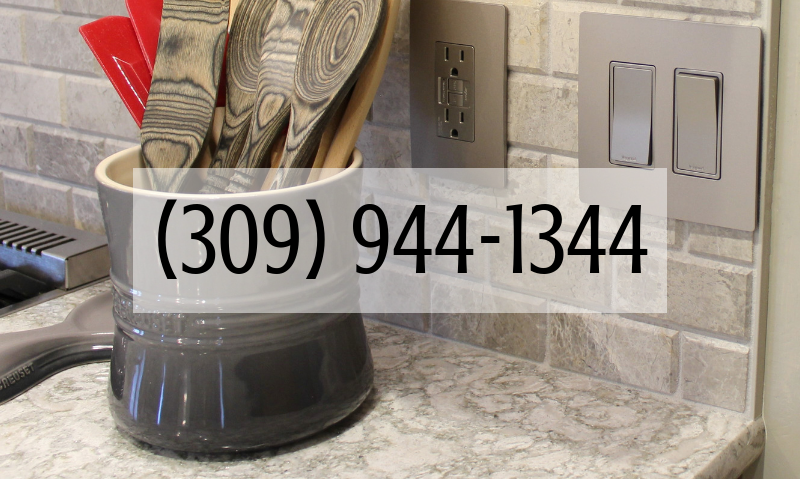 Or if you are reading this during the holiday weekend and just swore it would be your last one in your existing kitchen, shoot us a quick email here and we will follow up with you soon about starting your project. Have a fantastic Thanksgiving!